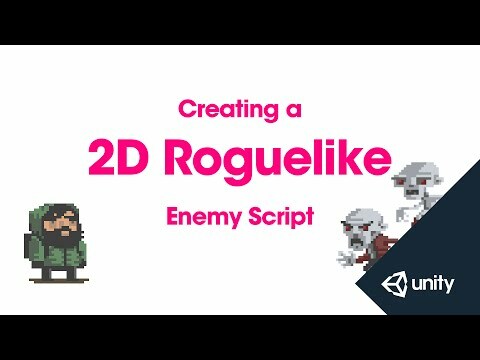 This is part 10 of 14 of the 2D Roguelike tutorial in which we write the Enemy script which will control the enemies movement and AI. In this video we're going to write the script for our enemies. C# script and we'll call it Enemy. Let's open it up in Monodevelop. You'll remember we wrote MovingObject in a previous video. Next we're going to declare some variables. We're going to start with a public integer called playerDamage. be subtracted when the enemy attacks the player. and tell the enemy where to move towards. to move every other turn. override the start function in our base class MovingObject. is we're going to get and store a component reference to our animator. in our base class MovingObject. because that's what we expect the enemy to be interacting with. is to check if skipMove is true. if so we're going to set skipMove to false and return. enemy to only move every other turn. along with the parameters for the xDir and yDir to move in. public function that returns void called MoveEnemy. to each of our enemies in our Enemies list. integer variables xDir and yDir and initialise those to 0.
and figure our which direction to move in. a number close to 0.
are in the same column. to move towards the player. meaning we're going to move down. we're going to move along the horizontal axis. using 1, a positive value. Otherwise we're going to move to the left using -1.
and parsing in our xDir and our yDir to move in. to move in to a space occupied by the player. which you'll remember we implemented as abstract. expect to encounter, which in this case is a player. which we're going to cast to a player. based on this enemy's attack. the update function and the comment for start. //Enemy inherits from MovingObject, our base class for objects that can move, Player also inherits from this. public int playerDamage;                            //The amount of food points to subtract from the player when attacking. private Animator animator;                          //Variable of type Animator to store a reference to the enemy's Animator component. private Transform target;                           //Transform to attempt to move toward each turn. private bool skipMove;                              //Boolean to determine whether or not enemy should skip a turn or move this turn. //Start overrides the virtual Start function of the base class. //Register this enemy with our instance of GameManager by adding it to a list of Enemy objects. //This allows the GameManager to issue movement commands. //Get and store a reference to the attached Animator component. //Find the Player GameObject using it's tag and store a reference to its transform component. //Call the start function of our base class MovingObject. //Override the AttemptMove function of MovingObject to include functionality needed for Enemy to skip turns. //See comments in MovingObject for more on how base AttemptMove function works. //Check if skipMove is true, if so set it to false and skip this turn. //Call the AttemptMove function from MovingObject. //Now that Enemy has moved, set skipMove to true to skip next move. //MoveEnemy is called by the GameManger each turn to tell each Enemy to try to move towards the player. //Declare variables for X and Y axis move directions, these range from -1 to 1. //These values allow us to choose between the cardinal directions: up, down, left and right. //If the y coordinate of the target's (player) position is greater than the y coordinate of this enemy's position set y direction 1 (to move up). If not, set it to -1 (to move down). //Check if target x position is greater than enemy's x position, if so set x direction to 1 (move right), if not set to -1 (move left). //Declare hitPlayer and set it to equal the encountered component. //Call the LoseFood function of hitPlayer passing it playerDamage, the amount of foodpoints to be subtracted. //Set the attack trigger of animator to trigger Enemy attack animation.